Product prices and availability are accurate as of 2019-04-19 05:46:31 UTC and are subject to change. Any price and availability information displayed on http://www.amazon.com/ at the time of purchase will apply to the purchase of this product. Stitch & ZipTM Preassembled Cosmetic cases are available in several designs, such as floral, nautical, animals, whimsical and many more. These unique needlepoint kits offer many different uses such as; coupon organizers, cosmetic case, sewing kits, stitching accessory case, Mahjong card case and many more. Use your imagination when thinking about the limitless things our Stitch & ZipTM cases and be used for. Adorn with beads, gemstones, metallic fibers and create a unique project all your own. 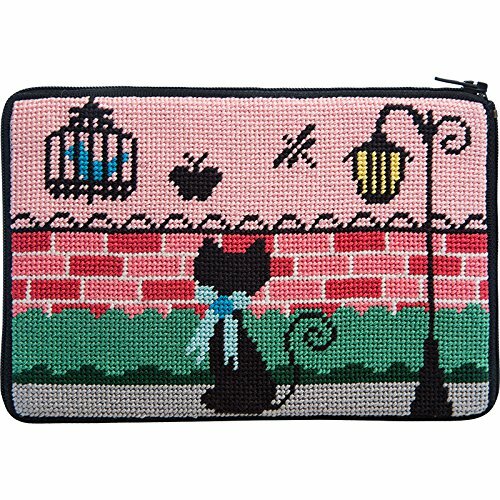 Kitty Kat design features a silhouetted black cat against a pretty pink street scene. Made in USA. Made in USA 7" x 4.75" Pre-assembled-- you just stitch! Kit includes color printed 14 mesh cotton canvas, nylon zipper, fabric back, cotton embroidery thread, needle and instructions.